Bhati Gate Wall City Lahore West Punjab. The Bhati Gate is located within Walled City of Lahore in Lahore, Punjab, Pakistan. Bhati Gate entrance is located on the Western wall of the Old City. It is one of the two oldest entry points into the Walled City which controlled the only major north-south thoroughfare during Ghaznavid period. When the Emperor Akbar expanded the city eastward and divided it into nine districts or Guzars, Bhati Gate and its bazaar marked the boundary between Guzar Mubarak Khan (east) and Guzar Talwarra (west). 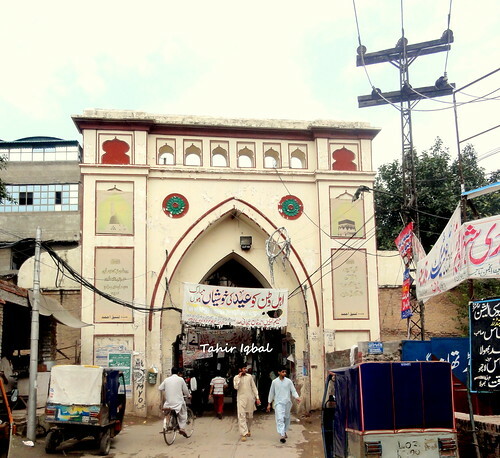 It was called Bhati Gate because it opens in the direction of Sandal Bar named after Rai Sandal Khan a Bhatti Rajput who lived there in ancient times. The area inside the gate is well known throughout the city for its food. Just outside of Bhati Gate is Data Durbar, the mausoleum of the Sufi saint Ali Hajweri (also known as Data Sahib Ganjbaksh). Every Thursday evening musicians used to gather here to perform Qawwali music, but these days qawalies have been replaced with Naats and religious sermons.